Blitz X 2.0 Robot Lawn M . . . The new robotic lawn mower from Wiper Blitz 2.0 is the successor of the well-known Blitz X. The 2.0 has like the previous model patented lawn recognition sensors that detects the lawn and doesn’t cut anything else. There is no boundary wire that has to be laid. The Blitz 2.0 is suitable for gardens with a size up to 400 m². "Perfectly suited for small & simple gardens"
The lawn can be separated from ponds, streets or flowerbed. The powerful 6-9 Ah lithium ions battery is durable and meets current high standards. Per operation Blitz 2.0 can be operated up to 3 ½ hours across the lawn and only needs a brief time to recharge. The maximum ascent of 50 % is very considerable and unique in this sector. "With a possible ascent ability of up to 50% the Wiper is extremely suitable for challenges." With great speed of 18 metres per minute the Blitz moves as a swift and effective pace. Convenient sensors like the shock sensors and a lift sensor provide for great amount of security. The possible cutting height is between 3.4 and 4 cm at a cutting width of 25 cm. With a weight of only 8.2kg and measurements of 50 x 43 x 30 cm the Wiper Blitz 2.0 can be easily transported. The volume is at a pleasant 65 dB. "Light and very agile the 2.0 moves across the ground"
The Impressive white with a wonderful form and excellent workmanship is just one of the features of this new robotic lawn mower Wiper Blitz 2.0. Its powerful but still elegant manner will surely fascinate every garden owner. Large blades that rotate quickly provide for excellent cutting results and a perfect lawn. Clean at the edges and corners the Blitz works with great precision through the garden. Furthermore, large slopes pose no problems. "The large powerful stainless steel blade provides for a perfect cutting pattern in the shortest space of time." A durable lithium ions 6,9 Ah battery is a distinguishing feature of the new robotic lawn mower Wiper Blitz 2.0. So that it can operate for long periods and effectively and the operating time is up to 3.5 hours. "The high quality lithium ions battery corresponds with the newest technical standards." With around 65 dB Blitz is pleasantly quiet and more tolerable than a petrol robotic lawn mower. For this reason you can use it at nearly any time of the day. The neighbours will love it thanks to its quiet operation. "Very quiet, can be used any time of the day." The Blitz 2.0 has a number of excellent technical features. A special sensor automatically recognises the lawn edges making it not necessary to lay down a boundary cable. This saves both time and costs. The all-wheel drive enables an ascent of up to 50 %. Shock and obstacle sensors enable the Blitz to detect obstacles and move around them. When it is lifted the blades immediately stop cutting and prevent any injury. "Technical features of the Wiper include many sensors and other things which meet the highest standards." 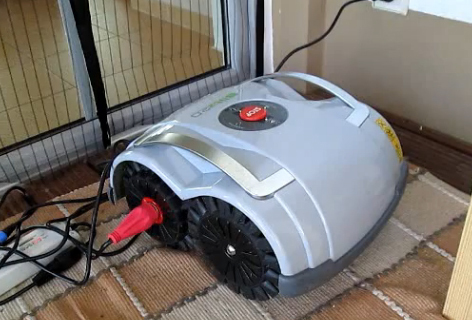 You can test the robotic lawn mower Wiper Blitz 2.0 in your garden. We give a two year guarantee on all our robots and free support. Should you have any questions or problems our HaushaltsRobotic team is personally at your disposal both by phone and email. Still unsure? Then test the Blitz for 14 days in your own garden and if you don’t like it you will get your money back!"